The main purpose of this investigation was to assess, in situ, the hourly abundance dynamics of enterobacteria and total heterotrophic aerobic bacteria (THAB), over a daily period, in 3 wells in Yaounde region, Cameroon. Sampling was done weekly, for 4 months. Water samples were collected in sterile glass bottles and incubated in situ for 2 h, 4 h, 6 h, 8 h, 10 h and 12 h. Isolation and enumeration of enterobacteria and THAB were performed on MacConkey agar (Bio-Rad) and standard agar (Bio-Rad) media, respectively, using the plate count method. Using a linear regression model, ln(number of CFUs) was plotted against time. The slope of each regression line was considered as the apparent increase or decrease in cell number. Concentrations of THAB and enterobacteria varied from 9.90 to 14.19 and 4.09 to 9.59 ln units-ml-1, respectively, in W1, from 9.90 to 14.25 and 3.00 to 5.39 ln units-ml-1 in W2, and from 9.90 to 14.00 and 6.55 to 11.51 ln units-ml-1 in W3. For the first 6-hour incubation period at all of the sampling points, the cell apparent growth rate (CAGR) varied from 0.023 to 0.262 h-1 for THAB and from 0.001 to 0.315 h-1 for enterobacteria; cell apparent inhibition rate (CAIR) varied from 0.015 to 0.615 h-1 for THAB and from 0.015 to 0.604 h-1 for enterobacteria. In the second 6-h incubation period, the CAGR varied from 0.010 to 0.822 h-1 for THAB and from 0.015 to 0.771 h-1 for enterobacteria; the CAIR varied from 0.015 to 0.260 h-1 for THAB and from 0.007 to 0.338 h-1 for enterobacteria. The values of physico-chemical parameters recorded before incubation displayed temporal and spatial variation over the sampling period. Bacterial abundance dynamics in some cases was significantly correlated to some of these abiotic factors. The abundance of the microorganisms decreased initially but later increased. Groundwater is present in the pores between soil or rock particles. When all of the pores are filled up and the soils and rocks are saturated, an aquifer is formed. While surface waters are easily polluted, groundwater is protected by the soil that covers it, which also acts as a filter for wastewater infiltration. Due to the absence of light the production of organic matter (photosynthesis, chemosynthesis) by autotrophic micro-organisms is excluded, organic carbon and other nutritive substances such as nitrogen and phosphorus are often present in low concentrations, and with relatively low temperatures and dissolved oxygen contents, groundwater has for a long time been considered as an unfavourable environment for microbial life (Gilbert et al., 1994). The origin of bacteria in underground water is often debated. Fenchel (2001) postulated that the ancestors of native underground ecosystems could have originated from a probable mutation of anoxigenic microorganisms. Other authors claim that, although the origin of some micro-organisms is uncertain, most underground bacteria derive from propagated infiltrated bacteria emanating from pollution of underground water by runoff (Mayer et al., 1997; Dzeda et al., 1998). Several studies have been carried out on the microbial quality of groundwater in various regions around the world. In the equatorial region of Central Africa it has been indicated that groundwater harbours stygobiontic fauna of various taxa (Zébazé Togouet et al., 2009). The isolated bacteria species include commensal species, and pathogenic as well as opportunistic species; their distribution undergoes fluctuations in space and time, and is sometimes influenced by physicochemical and meteorological factors (Nola et al., 2001, 2002). However, it is unclear whether the temporal variation in their abundance results from dilution by infiltrated water or, augmentation of bacteriological pollutants, or if it is related to death or cell growth in situ. Little data are available on daily bacterial dynamics in groundwater. Some authors in other regions of the world have indicated the potential heterotrophic activity of bacteria adhering to geological particles in groundwater (Alfreider et al., 2001). The purpose of this investigation was to assess, over a daily period, the hourly in situ fluctuation in abundance of enterobacteria and heterotrophic bacteria in wells without flux renewal, in the equatorial region of Cameroon (Central Africa). The Yaounde region is located at latitude 3°52'N, longitude 11°32'E and has an altitude of about 760 m amsl. The climate is typically equatorial, with 4 unequal seasons (Succhel, 1972). A mild rainy season from April to June, a mild dry season from July to August, a peak rainy season from September to November and a peak dry season from December to March. Soil is ferro-lateritic and acidic, the pH values in general being lower than 6 (Bachelier, 1959). Three well water points coded W1, W2 and W3 were chosen, based on their importance as a drinking water supply for the communities, the higher density of the neighbouring communities and the permanent presence of water in these wells during all seasons of the year. The depths of the wells were: 420 cm, 405 cm and 410 cm for W1, W2 and W3, respectively. During the experimental period use of these wells by the communities was temporarily halted for a period of 24 h. Each well point was sampled once a week. The study was carried out from April to July 2009 and weeks were numbered 1 to 17. At each well point on the sampling day, the water temperature and the water column thickness were measured. The water was initially collected in a 500 ml sterile glass bottle labelled T, and in a 1 000 ml clean polyethylene bottle. A volume of 500 ml of each sample was introduced in 3 series of 6 sterile glass bottles labelled A, B, C, D, E and F. Each of these bottles was attached to a thin sterilised wire and was immersed in the water column in the same wells at 6:00, thus incubated in situ. The sample labelled T and that in the polyethylene bottle were transported to the laboratory at 4°C, for bacteriological and physico-chemical analyses, respectively. The 3 samples labelled A were removed from the well column after 2 h of incubation. While the remaining bottles labelled B, C, D, E and F were removed from the well after 4 h, 6 h, 8 h, 10 h and 12 h of incubation, respectively. Each sample was immediately transported to the laboratory on ice for bacteriological analysis of the enterobacteria and total heterotrophic aerobic bacteria (THAB). The enumeration of enterobacteria and THAB was performed on MacConkey agar (Bio-Rad) and standard agar (Bio-Rad) media, respectively, using the plate count method (Marchal et al., 1991). The Gram staining and biochemical identification (including the use of D-glucose and nitrate, production of indole, presence or absence of catalase and oxidase) of enterobacteria were carried out according to Holt et al. (2000). Bacterial abundance was expressed as the number of colony forming units (CFUs) per ml of water. The physico-chemical parameters considered were temperature, pH, electrical conductivity, total suspended solids (TSS), colour, turbidity, CO2, NH4+ and BOD5. These parameters were chosen in accordance with the availability of laboratory reagents and their general importance for the bacterial survival in groundwater. The analysis was performed using standard methods (Rodier, 1996; APHA, 1998) and was carried out only on water sampled at 6:00 on the sampling day. The average values for the number of CFUs obtained from each water sample for each group of bacteria considered were transformed into ln units. The mean values of the bacterial abundances with respect to the sampling week number (numbered from 1 to 17) were illustrated by semi-logarithmic histograms. Ln(number of CFUs) was plotted against duration for each site during each sampling period. The incubation period was divided in 2 sub-periods: from the initial moment up to the 6th hour (from 6:00 to 12:00), and from the 6th hour up to the 12th hour (from 12:00 to 18:00). Graphs were then plotted for each of the two sub-periods considered. Each straight regression line equation (y = ax + b) was calculated using the method of least squares (Bailey, 1981; Tofallis, 2009). In this equation: y is the ln(number of CFUs), x is the incubation duration (2 h). The straight regression line obtained is equated with the exponential phase, for example, that of bacterial growth in non-renewed culture medium. The slope a of each regression line was considered to be the cell apparent dynamics for 2 h. Since the frequency with which samples were removed from the wells was every 2 h, each slope value was divided by 2 to obtain the hourly value for the apparent cell dynamics. This was compared to the cell apparent growth rate (CAGR), when positive, or to the cell apparent inhibition rate (CAIR) when negative. The Spearman correlation test was performed between the cell abundance dynamics and physico-chemical parameters recorded at the initial sampling time. The absolute values of CAIR were considered in this assessment. All calculations were performed using the SPSS 12.0 programme. Water column thickness ranged between 166 and 214 cm (Fig. 1), and water temperature between 19 and 20°C. Turbidity in W1 varied from 1.2 to 7.7 NTU, and in Wells W2 and W3 varied from 1.4 to 32.4 NTU, and 1.8 to 103 NTU, respectively (Fig. 1). The highest concentration of TSS was 10 mg-l-1 in Well W1, 30 mg-l-1 in Well W2 and 102 mg-l-1 in Well W3. The presence of TSS was sometimes rare in W1 (Fig. 1). Water colour reached 37 PtCo in Well W1, 152 PtCo in Well W2, and 494 PtCo in W3. In Well W1, water was sometimes colourless (Fig. 1). The pH values ranged between 5.45 and 6.04 in Well W1, between 4.93 and 5.35 in Well W2 and between 6.87 and 8.04 in Well W3. The highest concentration of dissolved CO2 for the three wells was 15.84 mg-l-1. The lowest concentration was 8.8 mg-l-1 for Wells W1 and W2 and 7.04 mg-l-1 for Well W3 (Fig. 1). The electrical conductivity fluctuated between 445 and 525 μS-cm-1 in W1, between 244 and 272 μS-cm-1 in W2, and between 524 and 767 μS-cm-1 in W3 (Fig. 1). The concentration of NH4+ varied from 2.65 to 5.05 mg-l-1 in W1, 2.42 to 3.94 mg-l-1 in W2 and from 5.1 to 10.2 mg-l-1 in W3. The BOD5 values ranged between 10 and 125 mg-l-1 in W1, between 5 and 25 mg-l-1 in W2 and between 5 and 100 mg-l-1 in Well W3 (Fig. 1). In Well W1, the abundance of THAB at the initial time ranged from 9.90 to 14.19 ln units ml-1 (Fig. 2). 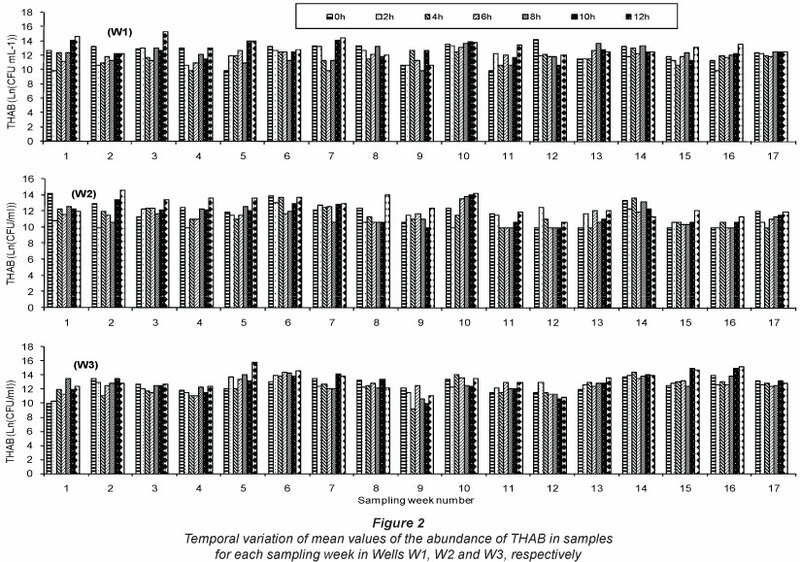 The abundance of THAB underwent temporal variations during the incubation periods. The highest CFU counts observed after 2 h, 4 h, 6 h, 8 h, 10 h and 12 h of incubation were 13.36, 13.00, 13.12, 13.71, 14.20 and 15.33 ln units-ml-1 respectively. During Week 5, a gradual increase in the abundance of THAB occurred, which ranged from 9.90 to 12.74 ln units ml-1 and was observed during the first 6 hours of incubation (Fig. 2). This phenomenon was also observed during the first 8 h of incubation in Week 13, and the abundance in THAB varied from 11.51 to 13.71 ln units-ml-1 (Fig. 2). In some sampling weeks, adecaeaee in WFU abundance was observed during the first few hours of incubation (Fig. 2). The CFU abundance in Well W1 varied from 9.90 to 13.12 ln units-ml-1 after 6 h of incubation, and from 10.60 to 15.33 ln units-ml-1 after 12 h of incubation (Fig. 2). In Well W2, the THAB abundance ranged from 9.90 to 14.25 ln units-ml-1 (Fig. 2). The highest value of the CFU abundance after 2 h, 4 h, 6 h, 8 h and 10 h of incubation was 13.08, 13.71, 13.49, 13.86 and 14 ln units-ml-1, respectively (Fig. 2). The lowest cell abundance after 6 h of incubation was 9.90 ln units-ml-1. The highest cell abundance recorded after 12 h of incubation was 14.63 ln units-ml-1, recorded in Week 2. In this week, the initial CFU abundance was 12.97 ln units-ml-1; after 2 h, 4 h, 6 h, 8 h and 10 h of incubation, it was 9.90, 11.98, 11.51, 10.60 and 13.4 ln units-ml-1, respectively (Fig. 2). In Well W3, initial THAB abundance ranged from 9.90 to 14 ln units-ml-1. During the incubations an increase in abundance occurred in some sampling weeks, as observed in Wells W1 and W2 (Fig. 2). The greatest CFU abundance observed after 2 h, 4 h, 6 h, 8 h, 10 h and 12 h of incubation was 13.91, 14.39, 14.41, 14.26, 14.93 and 15.88 ln units-ml-1, respectively (Fig. 2). Durins Weekmsia and 14ragradual incpeaee svasobserved in the first 4 hours, from 11.98 to 12.90 ln units-ml-1 and from 13.77 to 14.39 ln units-ml-1, respectively (Fig. 2). During Weeks 6 and 7, the CFU abundances at the initial moments were 13.08 and 13.51 ln units-ml-1, respectively. After 6 h of incubation, the counts were 14.41 and 12.10 ln units-ml-1, respectively. The highest CFU abundances were recorded after 12 h. The values were 14.63 and 13.81 ln units-ml-1, respectively (Fig. 2). Bacteria isolated on MacConkey agar medium (Bio-Rad) and considered as enterobacteria were: straight rods, Gram negative, indole-producing, nitrate-reducing, D-glucose fermenting, oxidase negative and catalase positive. The initial number of enterobacteria in Well W1 fluctuated between 4.09 and 9.59 ln units-ml-1 (Fig. 3). The highest value of the CFU abundance after 2 h, 4 h, 6 h, 8 h, 10 h and 12 h of incubation was 7.97, 7.93, 7.91, 8.13, 8.40 and 9.18 ln units-ml-1, respectively (Fig. 3). In this well, with the exception of Week 1, a decrease was observed in cell counts of enterobacteria during the first hours of incubation. This decrease was followed by a stationary phase, after which an increase in the number of cells was observed. During some sampling weeks, the number of cells remained unchanged for 4 or 6 hours of incubation. This was observed in Weeks 3, 9 and 11 (Fig. 3). In Weeks 3, 7, 8, 11 and 12, the number of cells of enterobacteria recorded after 12 h of incubation was lower than that recorded in the initial stages of the study (Fig. 3). The highest value (9.18 ln units-ml-1) recorded after 12 h of incubation was in Week 5. In this week, the CFU abundance was initially 7.04 ln units-ml-1 and dropped to 5.30 ln units-ml-1 after 6 h of incubation (Fig. 3). In Well W2, the number of enterobacteria fluctuated between 3.00 and 6.40 ln units-ml-1, and decreased during the first hours of incubation. In some sampling weeks, cell numbers remained unchanged for 4 or 6 h of incubation. The highest cell numbers observed after 2 h and 4 h were 5.48 and 4.79 ln units-ml-1, respectively. After 6 h of incubation, the number of enterobacteria ranged between 3 and 4.61 ln units-ml-1 (Fig. 3). The highest number of enterobacteria was observed after 12 h of incubation and was 7.44 ln units-ml-1, recorded in Week 16. During this week the initial concentration was 3 ln units-ml-1, and increased to 4.61 ln units-ml-1 after 6 h (Fig. 3). In Well W3, the initial cell concentration ranged between 6.55 and 11.51 ln units-ml-1, and observed temporal variations in CFU abundance were also similar to those of other sampling sites (Fig. 3). The highest values of cell abundance observed after 2 h, 4 h, 6 h, 8 h, 10 h and 12 h of incubation were 11.51, 11.00, 11.07, 11.00, 11.16 and 11.29 ln units-ml-1, respectively. As noted for other sampling sites, cell abundance sometimes remained unchanged during the first 4 h of incubation (Fig. 3). The cell abundance dynamics was assessed during each of the two parts of the incubation period considered (from Time zero (T0) to the 6th hour, and from the 6th hour to the 12th hour). It appeared that a decrease in the concentration of cultivable THAB and enterobacteria occurred in most cases during the first 6 h of incubation (Tables 1-2). The CAIR of the THAB during this incubation period ranged between 0.035 h-1 (Week 15) and 0.615 h-1 (Week 7) in Well W1, between 0.073 h-1 (Week 12) and 0.349 h-1 (Week 11) in Well W2, and between 0.015 h-1 (Week 14) and 0.258 h-1 (Week 2) in Well W3 (Table 1). During this period, the highest CAGR for THAB was 0.425 h-1 in Well W1 (Week 5), 0.245 h-1 in Well W2 (Week 10), and 0.262 h-1 in Well W3 (Week 1) (Table 1). During the second incubation period (from the 6th to the 12th hour), the abundance dynamics of the THAB were positive in most cases. The CAGR ranged between 0.035 h-1 (Week 9) and 0.822 h-1 (Week 7) in Well W1, between 0.020 h-1 (Week 13) and 0.607 h-1 (Week 2) in Well W2, and between 0.010 h-1 (Week 6) and 0.439 h-1 (Week 16) in Well W3 (Table 1). It was noted that the highest CAGRs of the THAB registered during this period were preceded by negative values of cell abundance dynamics recorded during the first period (Table 1). The highest CAIRs during the second period were 0.075 h-1 in Well W1 (Week 13), 0.125 h-1 in Well W2 (Week 14) and 0.260 h-1 in Well W3 (Week 9) (Table 1). 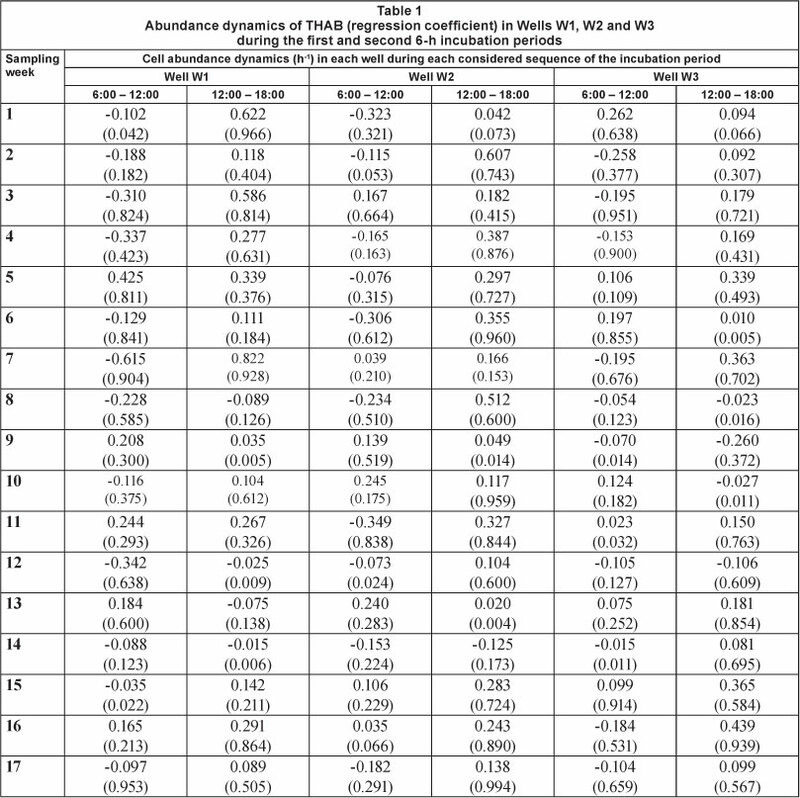 In Weeks 8, 12 and 14 in Well W1, the cell dynamics of the THAB were negative during the two incubation periods (Table 1). The CAIRs during the first and second period were 0.228 h-1 and 0.089 h-1, respectively, for Week 8, 0.342 h-1 and 0.025 h-1, respectively, for Week 12, and 0.088 h-1 and 0.015 h-1, respectively, for Week 14 (Table 1). In Well W2, the CAIR decreased in Week 14 from 0.153 h-1 in the first incubation period to 0.125 h-1 in the second. The same observation was made in Well W3 in which the CAIR value decreased in Week 8 from 0.054 h-1 to 0.023 h-1. However, in the same well in Week 9, an increase in CAIR from 0.070 h-1 to 0.260 h-1 was observed (Table 1). Between Weeks 8 and 9, no change in climate and temperature was observed, though a mild rain fell in the region 2 days before Week 9. The CAIR value for the enterobacteria in the first incubation period (6:00-12:00) ranged between 0.015 h-1 (Week 16) and 0.604 h-1 (Week 7) in W1, between 0.035 h-1 (Week 4) and 0.565 h-1 (Week 6) in W2, and between 0.017 h-1 (Week 17) and 0.326 h-1 (Week 7) in W3 (Table 2). During this period, the highest CAGR noted was 0.127 h-1 in W1, 0.241 h-1 in W2, and 0.315 h-1 in W3. The CAGR ranged between 0.072 h-1 (Week 2) and 0.771 h-1 (Week 1) in W1, between 0.035 h-1 (Week 2) and 0.610 h-1 (Week 16) in W2, and between 0.015 h-1 (Week 4) and 0.444 h-1 (Week 7) in W3 (Table 2). As in the case of the THAB, the abundance dynamics of the enterobacteria were found to be positive in most cases during the second incubation period (12:00-18:00). A Spearman correlation test was performed between the cell abundance dynamics and physico-chemical parameters recorded before incubation. 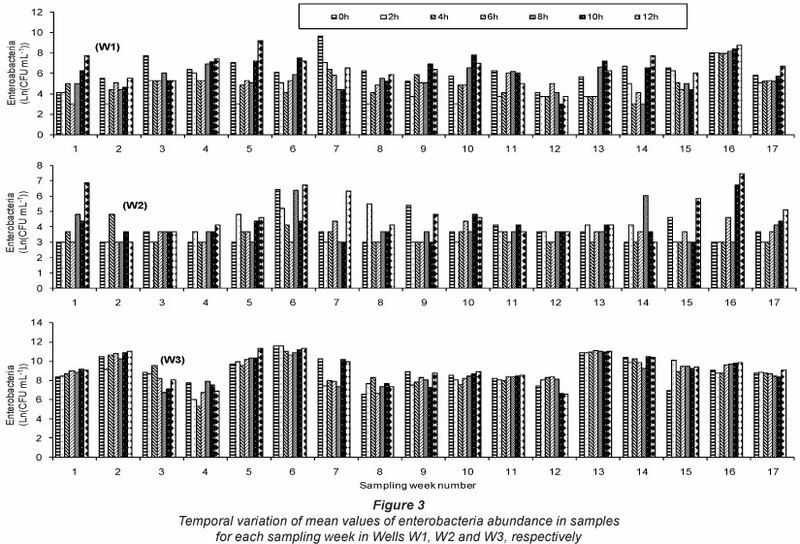 Results revealed that BOD5 was significantly correlated (P<0.05) with abundance dynamics for enterobacteria in W2, during the incubation period from 6:00 to 12:00 hour, and with the abundance dynamics of THAB in W3 over the same period (P<0.01) (Table 3). 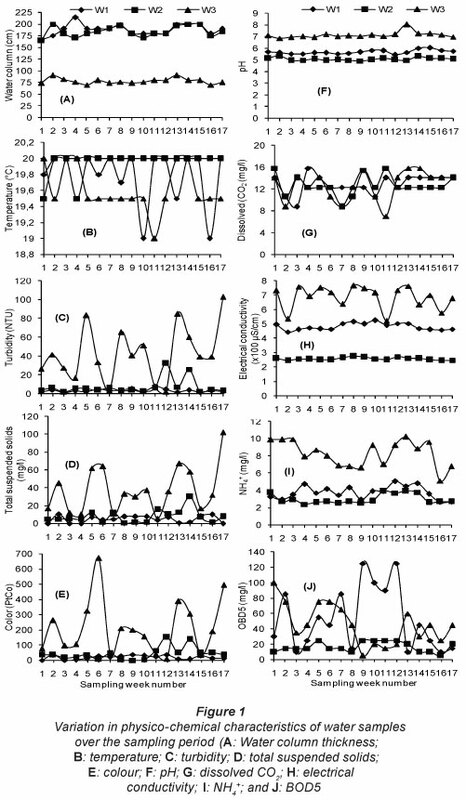 In W1, the cell abundance dynamics of THAB was correlated (P<0.01) with pH during the first 6 h of incubation, and with water colour (P<0.1) during the second incubation period (Table 3). The variation of the water column thickness was correlated with the abundance dynamics of enterobacteria (P<0.01) during the first 6 h of incubation. 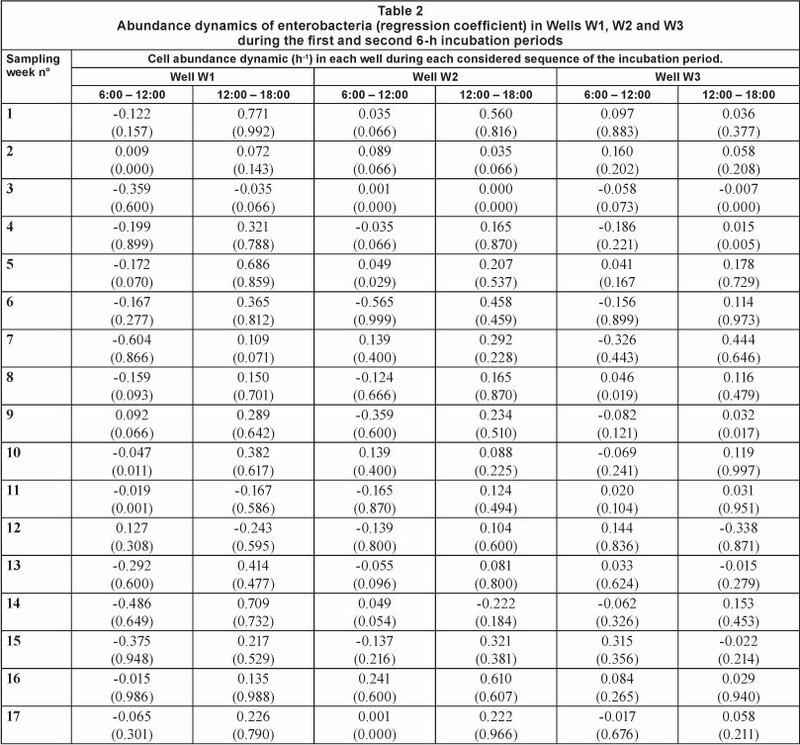 CO2 was correlated (P<0.1) with the abundance dynamics of enterobacteria and THAB in W1 and W2 (Table 3). In W2, the increase in CO2 concentration and NH4+ may have resulted in cell growth during the first incubation period and cell inhibition during the second period (Table 3). This study showed that the abundance of enterobacteria and other heterotrophic aerobic bacteria in groundwater fluctuated during the day. Such changes could result in a decrease or increase in cell abundance. The hourly rates of change in cell numbers over the study period varied between 0.015 to 0.615 h-1 for THAB and between 0.007 to 0.607 h-1 for enterobacteria (Tables 1 and 2). The inhibition rate observed would be related to the starvation response of the cells due to the difficulty in degrading the organic matter present, or due to their growth (Mailloux and Fuller 2003). It has previously been reported that groundwater also harbours stygobiontic fauna of various taxa, and protozoa (Fusconi and Godinho, 1999; Zébazé Togouet et al., 2009). The literature has indicated that selective and non-selective grazing of groundwater bacteria by nanoflagellates can occur during incubation, and that uptake rate depends on the concentration of bacteria and predators (Kinner et al., 1998). Bengtsson (1989) noted that groundwater bacteria from an oligotrophic environment showed a mixed strategy of economised metabolism. The CAGR values varied from 0.010 to 0.822 h-1 for THAB, and from 0.001 to 0.771 h-1 for enterobacteria (Tables 1 and 2). Harvey and George (1987) studied wells where the temperature ranged between 11 and 14°C, and detected bacterial growth rates ranging from 0.005 to 0.042 h-1; the highest growth rate was recorded in wells with higher temperature. Mailloux and Fuller (2003) have recorded that in some underground waters the generation time of Comamonas sp. and Acidovorax sp. ranges between 3.90 and 5.08 h, and between 5.53 and 6.97 h, respectively. This corresponds to a growth rate ranging between 0.197 and 0.256 h-1 for Comamonas sp and between 0.143 and 0.181 h-1 for Acidovorax sp. These authors reported that the groundwater sampled was relatively poor in biodegradable organic matter (less than 50 mgT-1). In this study, the BOD5 values ranged between 5 and 125 mg-l-1 (Fig. 1). The differences among wells in the concentration of BOD5 are the likely origin of the relative differences noted in CAGR or CAIR values. In most cases, there was a relative decrease in cell numbers during the first 6 hours of incubation (Figs. 2-3). This behaviour is similar to that reported in previous studies of the introduction and dynamics of bacteria in groundwater. Van Elsas and Heijnen (1990) and Alden and co-workers (2001) indicated that the introduction of bacteria in soil is usually followed by an initial decrease in biomass of the introduced cells, due to environmental influences on cell survival and the stability of abiotic factors such as texture and soil particle size, and dynamic abiotic factors such as temperature, water content, pH, nutrients and other chemicals. The slight decrease in the abundance of enterobacteria and other heterotrophic bacteria during the first hours of incubation could be due to their adaptation to the new environmental conditions. Abundance dynamics of bacteria in water environments could also be impacted by viral activity (Yates et al., 1990). Pachepsky et al. (2006) indicated that bacterial metabolism is relatively inhibited during the adaptation step and this is followed by re-growth. The slight decrease during the first hours of incubation could also be attributed to interaction amongst cells. According to Fallon and Perri (1996), one of the important criteria which influence the survival of the organisms in groundwater is their ability to compete for substrate and nutrients. Temporal changes in cell abundance were in some cases significantly correlated with initial physico-chemical characteristics of the water, such as pH, colour, BOD5, dissolved CO2 and NH4+ (Table 3). The most favourable pH range for enterobacterial survival in groundwater is 6-7 (Reddy et al., 1981). In addition, the pH of the environment affects the solubility of compounds and the charge distribution in the system (Fallon and Perri, 1996). In this study, the pH values ranged between 5.45 and 6.04 in W1, between 4.93 and 5.35 in W2, and between 6.87 and 8.04 in W3 (Fig. 1). The enterobacteria found in these wells have most likely adapted to survive in these different environmental conditions. Mouser et al. (2009) assessed the influence of ammonium on bacterial community structure and the physiological status of contaminated groundwater. Analysis of the 16S subunit of rRNA gene sequences suggested that ammonium may be one of the important factors influencing community composition. In addition, it is the primary source of nitrogen during some geochemical reduction reactions in groundwater systems. The colour of the water is related to the dissolution of metals, which often acts selectively on the evolution of microbial populations in ground water (Benyehuda et al., 2003). The water temperature in this study ranged between 19 and 20°C (Fig. 1). No significant influence of this factor on the changes in CFU abundance was noted (Table 3). However, studies of temporal changes in groundwater quality when stored at different household conditions have noted that the highest CAGR of the THAB at Day 3 of storage was 0.249 d-1 at 3°C, 0.559 d-1 at 10°C, 0.924 d-1 at 18°C, and 1.233 d-1 at 25°C; however, at Day 7 of storage, it was 0.362 d-1 at 3°C, 0.497 d-1 at 10°C, 0.690 d-1 at 18°C, and 0.672 d-1 at 25°C (Nola et al., 2010). The absence of a significant correlation with temperature might be due to the incubation duration, which was relatively shorter in the current study. Bacterial abundance underwent temporal variation. The stabilisation of cell abundance for several hours which was sometimes observed during incubation could be related either to the depletion of available energy sources, or to the effect of certain products synthesised by a small proportion of microorganisms, which in turn act on the majority of cells by inhibiting their metabolism or by lengthening their lag time (Li et al., 2006). The impact of the water column thickness on the bacterial abundance fluctuations might be due to a hydrological process in the groundwater environment, and this could affect the chemical composition of the water. In the aquatic environment in general, multiple microorganisms coexist as communities competing for resources. Attributes such as growth rate and production of quorum-sensing inhibitors may allow bacteria to effectively interact and coexist in a water environment (Kolter and Losick, 1998). Simoes et al. (2007) studied the interactions amongst most species of Methylobacterium, Sphingomonas, Burkholderia, Staphylococcus and Acinetobacter genera and noted synergy/ cooperation between some species, and antagonism and neutral interaction between others. In addition, chemical elements have a major influence on micro-organism survival in the aquatic medium. In return, micro-organisms influence water physico-chemical properties through release of diverse metabolic wastes, in response to variation of environmental conditions (Tiago et al., 2004; Todar, 2007; Krammer et al., 2008). Some of these metabolic wastes can be harmful to other living microorganisms in the ecosystem. Although the investigation has been carried out in the mesocosm, the results suggest that the abundance dynamics of microorganisms in groundwater might initially show a decrease in abundance followed by an increase. Moreover, temporal variations of bacterial abundance in groundwater which have been widely reported in the literature might be due to the in situ inactivation or growth of many cells, in addition to other phenomena such as dilution by infiltrating water, or cell retention on geochemical particles in suspension. This will depend on the microbial group investigated. Received 10 December 2009; accepted in revised form 5 October 2012.